Hala Pa'ani. Beautiful Ocean View Home. 4 Bedrooms. Perfect for a monthly rental! Please contact us about monthly rentals! This home is perfect for longer stays. Enjoy 1.5 acres of spectacular sunsets and ocean views! Large wrap around lanais with sweeping views of Hawaii's five mountains and panoramic sea views, this luxury home in Kohala Estates offers a quiet retreat with easy access to all that Hawaii Island invites you to enjoy. A stunning spot to enjoy the wonderful starry nights at approximately 550 elevation, less than a mile from shore - close enough to see the humpback whales all winter, and, the occasional pod of acrobatic dolphins at play closer to shore. The upstairs living area and kitchen boasts high ceilings and great spaces for entertaining with an open concept floor plan. The master suite with an Eastern King Bed has a fabulous view plus a private spa like bathroom. There is a brand new television in the Master Bedroom. There is a second bedroom with a California King and bathroom upstairs with great mountain views. Downstairs boasts two more bedrooms with Queen beds, a full bath and a second living area with cable television. There is plenty of room to enjoy your own personal space here. This home does not offer Air Conditioning however at this elevation you rarely need it and the home is equipped with a solar powered vent that helps keep this casa cool has it pulls warmer air out through the vent. It offers year around amazing tropical breezes. It is located on a culdesac street with views in every direction. Amenities include: upstairs and downstairs lanais with 1700 square feet of outdoor area under roof with dining and sitting areas; free WiFi internet access; cable television in the lower living room only and full laundry facilities downstairs, beach gear and much more located in the laundry room. The full service kitchen provides for all your cooking needs. Outdoor grill is provided. 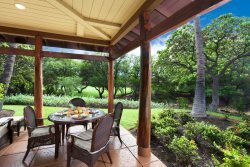 This home offers easy access to nearby Kawaihae Harbor, stunning white-sand Hapuna Beach State Park, Mauna Kea Resort, championship golf, great restaurants, local fish market, and much more. Please note: no parties/events/loud noise/loud music allowed. This home is located in a tranquil/residential community. Wonderful home, would most definitely recommend to friends. We loved that it was so peaceful with marvelous views. Off the grid and away from the more crowded tourist spots. Had everything we could possibly need.